Bruges Part Deux: Bruges Harder! Due to being advised that Disneyland Paris required five days to be fully appreciated, I was only able to allocate one full day in Bruges during my last European trip. After having a miserable time in Disneyland, and falling completely in love with Bruges, I vowed to rectify this huge planning mistake by making it my home base in Belgium for five full days on this trip. So, early on a Thursday morning, we headed to CPH for our $72 per-person Brussels Airlines flight to BRU, Belgium’s main airport. While waiting for the flight, we blew all of our remaining Danish Kroners on booze at the Duty Free shop, which was good, since the damn things aren’t used anywhere else in the world. Leonard Kinsey enjoying the tastes of Bruges, Belgium. After a short ninety minutes in the air, we landed in Brussels and boarded a train to Bruges Central. From there it was a loud luggage-clattering-on-cobblestones fifteen minute walk to the AirBnb. Prior to my previous European trip, people kept telling me that Bruges was a “mini-Amsterdam”, and my reaction was always: “Why would I want to go to a small version of Amsterdam? Why not just go Amsterdam?” It wasn’t until I actually visited the town that I realized it’s not just a smaller version of Amsterdam, it’s also much more quaint and charming and relaxing and cozy. — The Old Chocolate House, which bills itself as home to the best hot chocolate in Bruges. It’s served in an interesting manner: they give you a bunch of chocolate chips in an edible chocolate cup, along with a mug full of steaming milk, into which you whisk the chocolate. I guess the idea is to let you carefully achieve your preferred milk-to-chocolate taste ratio, but my mom is a chocolate fiend, so she just dumped them all in straight away. I’m not a big sweets guy, but she absolutely loved it, and was also smitten with the Belgian waffle we ordered. — A weekend flea market along the Dijver canal, which was filled with old weird trinkets. — A visit to the Basilica of the Holy Blood, which houses a cloth supposedly used by Joseph of Arimathea to clean the blood off of Jesus after he died. Unfortunately, we weren’t aware that the cloth is only shown to the public every Friday (and every day from May 3rd to 17th), so we didn’t get to see it. 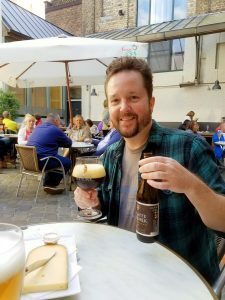 –Beers at ‘t Brugs Beertje, a world-famous “brown bar” that carries three hundred different bottled Belgian beers, and five drafts. Every beer is served in its own unique and special glass; even if they only have one bottle of a particular beer, that beer will have a glass on the shelf just waiting to be used! — Dinner at La Dentelliere, a charming restaurant across from the swan-filled Minnewater Park. Like many restaurants in Bruges, they serve the local specialty: mussels in a variety of sauces, including cream, white wine, garlic, cream and curry, cream and white wine, and cream and beer. Being a vegetarian, I didn’t partake, but I did get cheese croquettes, which sound much fancier than what they are: fried cheese. — A long but pleasant walk to the St. Janshuis and Koelewei windmills, which are on the east side of town on the outer canal ring. St. Janshuis was built in 1770 and is actually a functional windmill that still grinds flour. Even losing my $500 DJI Spark drone in a canal (full story at https://youtu.be/ghOjZL14has) didn’t put a damper on what ended up being a lovely trip to what must be one of the loveliest cities in the world.